Today was undoubtedly the busiest day of HIMSS for me, and my trusty Garmin certainly agrees with my assessment since it shows 22,212 steps. I started my day at the Edifecs booth (1674) chatting with them about their #WhatIRun campaign to elevate the visibility of female healthcare leaders and to inspire young women to pursue STEM careers. They’ve partnered with Ryka to give away some outstanding pink suede slip-ons while promoting the initiative. I’ll be sporting a pair tomorrow in the hall since my feet definitely need some TLC after today. 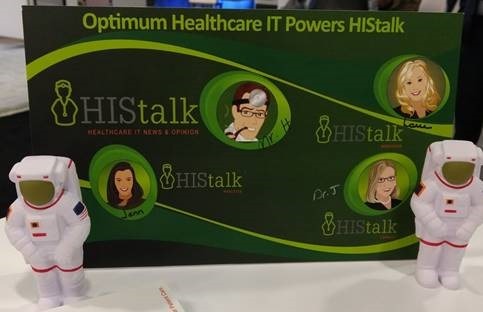 Healthcare IT remains male-dominated across many domains and it’s important for girls and young women to see women who code and women who lead. 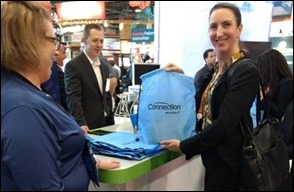 This is the third year for Edifecs to lead this charge at HIMSS and I’m grateful. I’ve been the recipient of a couple of sexist comments this week – things that people would never, ever say to a male CMIO – so we definitely have a long way to go. Stop by and say hi, grab a tee shirt, pick up a Ryka discount card, and enter to win a pair of sweet treats for your feet. 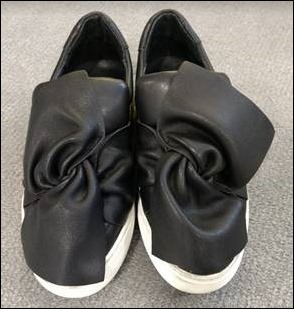 In the “Best Comfort Shoes for Women” category, I spotted a sassy marketing staffer getting ready to change into these as she transitioned from day to evening. The “Best Total Footwear Ensemble” category, I spotted Drew Madden with blue laces to match his striped socks. The gents from Lightbeam Health had been in the running until Drew knocked them out of contention. Since we’re giving out awards, “Best Booth Snack” goes to Bonny Roberts at Diameter Health in the Interoperability Showcase. Yesterday she was giving out Girl Scout Cookies, although I didn’t see any today. 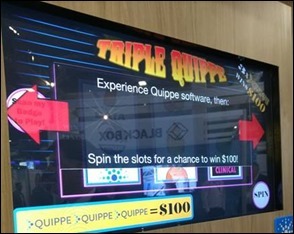 Medicomp Systems always has a game in their booth (3616) and this year’s Quippe Virtual Experience game could win you $100. Cheers to their neighbor Blackbox, reflected in the image, who hosted a happy hour and was inviting everyone who passed by to partake with them, whether vendor or attendee. 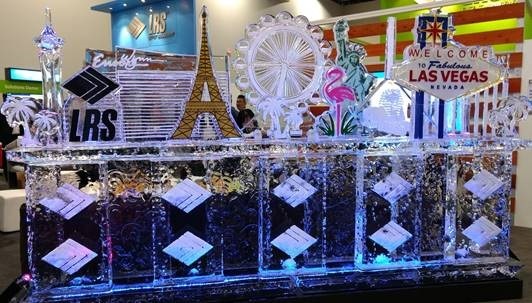 “Best Booth Décor” goes to LRS Output Management with this phenomenal ice sculpture. They have a different one every day. 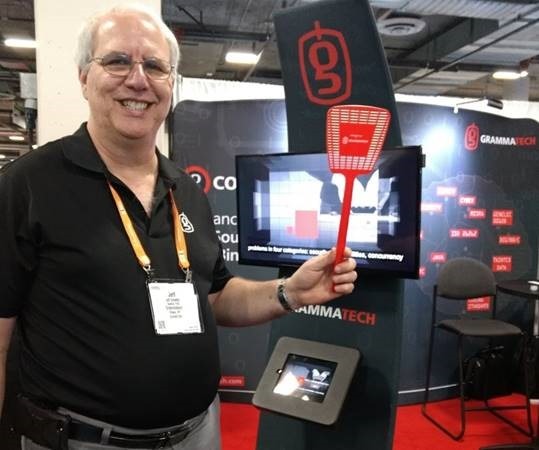 “Best Promotional Item” goes to Jeff at Grammatech (12144) with what every developer needs: a bug-removal device. Jeff was engaging and caught our attention. 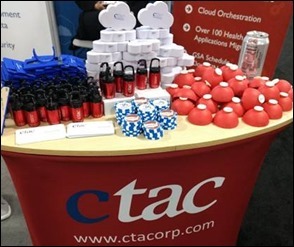 “Most Organized Merchandising” goes to CTAC in booth 11616. I’ll forgive them the accessory Diet Coke because the person working on the merchandising set it down to step out of the photo. “Best Jacket” goes to OnRamp, who had several booth staffers sporting this look. 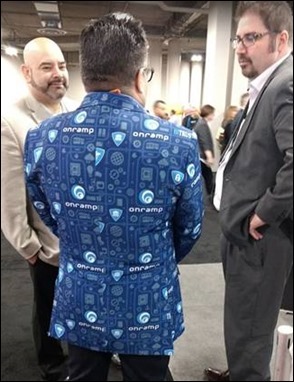 There was plenty of sartorial splendor on display today, with these chaps from MD EMR Systems. I’m a sucker for exhibitors that are doing good for the world, including Connection (3828), who invited attendees to fill a bag with art supplies for donation to children. On Thursday, they’ll be making no-sew blankets for charity as well. Lots of positive vendor engagement today, with Hanna from Zayo Group catching our attention during my annual BFF booth crawl with the incomparable Evan Frankel. 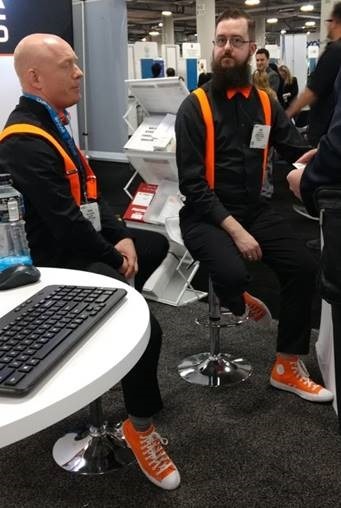 Effective strategies: catching someone’s eye, asking them what they do, asking what they are interested in at HIMSS, and figuring out how to tie it to your company. 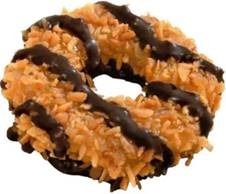 I’m going to track them down next time I’m in Boulder, Colorado. 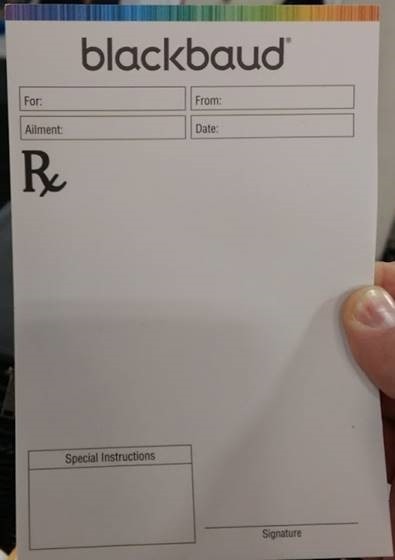 Blackbaud was giving out faux script pads. 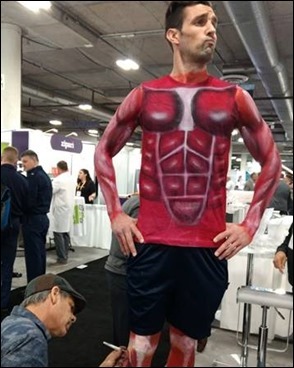 More anatomic body painting today, although the guy was wearing a shirt and shorts where yesterday’s model was wearing the equivalent of a bikini swimsuit. Plenty of sponsor signs out in force today. I loved Optimum Healthcare IT’s astronauts. Signs were also spotted on prominent display at Meditech, Waystar, Access, Iatric Systems, and Redox. I bumped into Jenn at the Strata Decision Technology booth and had a chance to talk to CEO Dan Michelson about the challenges of helping healthcare organizations truly understand cost accounting and what they need to get a handle on if they’re going to try to lower costs and increase value. He sent me on my way with some in-flight reading material, in case I don’t have Wi Fi on the way home. I stopped by the Vocera booth to get a look at their Collaboration Suite, which integrates with AirStrip patient monitoring. 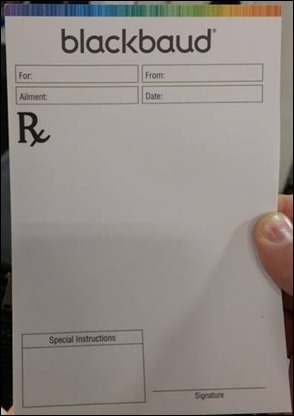 Being able to view the rhythm strip of a telemetry patient from my family medicine clinic would have saved me a lot of heartburn when I cared for hospital patients. I finished out the day with Zynx Health, looking at their Knowledge Analyzer solution. 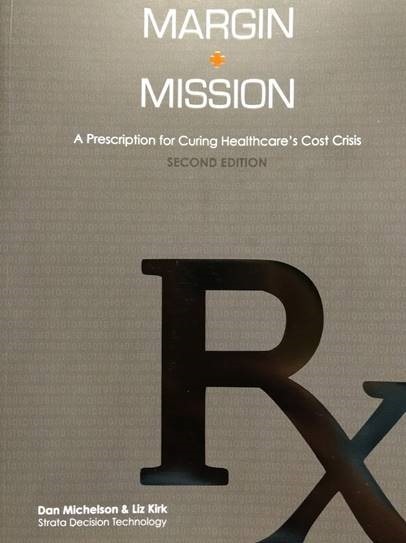 It allows organizations to update order sets and perform a gap analysis of their current implementation against best-available medical evidence, guidelines, and performance measures. I’ve got some battle scars from trying to harmonize order sets across various groups of attending physicians and across hospitals within Big Health System and I wish I had a solution like this years ago. The evening was full of adventure, starting with the New Media Meetup at Senor Frog’s at Treasure Island. I enjoyed connecting with other bloggers, vloggers, and social media personalities while trying to juggle my drink, grab some snacks, and stay anonymous. From there it was on to the Nordic reception at Caesar’s Palace at the Mr. Chow restaurant. The main dining room features a large kinetic sculpture that raises, lowers, splits, turns, and rejoins itself. The best part of the event was the pool-view balcony, where I eagerly took in the fresh air I had been missing most of the week. Thursday is my last day at the conference, so it’s off to pack and get some rest before I cram in the last round of booth visits. 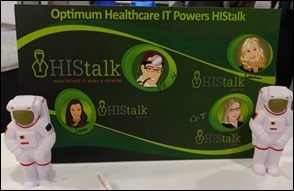 Thought I would send my thanks to all the HISTalk team for their ability to give me the impression I was in attendance. Honestly, don’t think I missed a sales opportunity by no attending this year. See you in Orlando (closer and less expensive) next year. 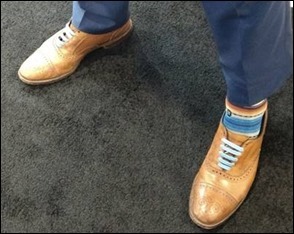 Thank you for including this comment, “I’ve been the recipient of a couple of sexist comments this week – things that people would never, ever say to a male CMIO – so we definitely have a long way to go.” So many of my male colleagues just frankly don’t believe, or seem skeptical that this behavior is as widespread as it is, suggesting that it’s only “the creeps” who make comments like that, and that the comments are rare. Nope. 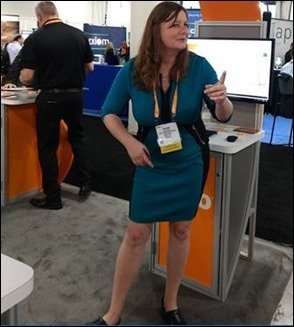 Next year I should register a hired female model as a CMIO or other executive, then wire her with a hidden body camera to record inappropriate remarks made in the exhibit hall or parties. I guess I would have to blur the faces of the offenders legally, but it might be an eye-opener for men to see what it’s like to be on the wrong side of their misbehavior, intentional or not. Lightning Bolt booth 12107 has a custom tea blend bar – one of the cooler (steamier?) HIMSS giveaways this year I’ve seen. And, did you catch the news on Tuesday about Blue Shield of California mandating HIE participation for all their network doctors and hospitals as part of the CMS MyHealthEData program? That’s a huge resurrection for the HIE idea and I think the first health plan to create that kind of requirement. If yes, what is the number or percentage of women in the Healthcare IT space that ensures sexist comments stop? Please don’t take the easy way out and say 50%. I’m not aware of any profession or job where the number of females involved exactly matches the female population percentage just as no profession or job exactly matches the percentage population of Blacks, Hispanics, Asians, etc.